Rural areas tend to be more lightly regulated than cities or suburbs, and some have limited building codes or even no building codes at all. Therefore, they naturally attract tiny house builders who wish to build houses that are on wheels, below a certain size, or otherwise non-code-compliant. A good example of this approach is THT commenter LaMar Alexander, who runs a site called Simple Solar Homesteading. He and others advocate rural living as a return to simplicity, arguing it can help save money and improve quality of life. A rural tiny house “community” would likely be fairly spread out. Such a community could perhaps organize around institutions like churches and schools, or via the Internet. Ability to implement sustainable features (composting toilets, rainwater collection, even grey- and black-water treatment and reuse, all of which are difficult or impossible in urban areas). Potential cost savings in terms of permit fees, utility costs, and perhaps even property taxes. Quieter life with more access to open land and outdoor activities. Farther from services and amenities, usually requiring car trips to reach stores and other places, so gas consumption may offset the “sustainability” and affordability benefits mentioned above. Farther from jobs, again requiring car trips. Potential isolation from neighbors and community activities. A recent article here on THT brought up the idea of a tiny house subdivision. No need to reinvent the wheel, though. There’s already a model for a subdivision of tiny houses: it’s called a mobile home community. These are also known as mobile home parks, RV or camper parks, or manufactured home communities or parks. They’re also known by another name, “trailer parks”, which, unfortunately—at least in the U.S.—carries a lot of negative stereotypes. The negative stereotypes are usually unfounded. True, mobile home communities often attract low-income people, but then so does the tiny house movement, and that’s precisely the point. Both offer a downsized, low-cost model of housing that works for a wide variety of people. In addition, mobile home communities, if well-organized, can offer a real sense of “community”, as well as many shared services, that most suburban neighborhoods can’t provide. 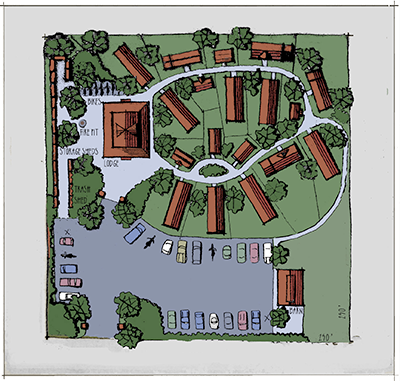 As mentioned before, the tiny house village being proposed by the Four Lights Tiny House company is one great model to watch. City and county planners are generally familiar with the mobile home community model. 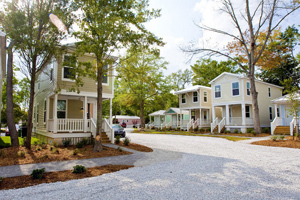 Another set of examples are several cottage communities that were developed on the Mississippi Gulf Coast after Hurricane Katrina, including Anchor Square and Cottages at Oak Park. These developments raise several questions, of course. How closely together can and should tiny houses be placed? What kind of rules or organizations should be put in place to govern these communities? Should ownership of the house and parcel be required, or could renting be an option? Greater chance of access to public transportation via bus or light rail. The potential for shared resources (laundry facilities, swimming pool, common house), making these resources more affordable and efficient. Increased ability to socialize with neighbors, especially if it is a community of like-minded tiny house folks. Still not the most efficient land-use model; conducive to sprawl (though perhaps on a lesser extent than traditional suburbs). Potentially vulnerable to natural disasters like hurricanes and tornadoes, making adherence to building codes important. One of the most encouraging trends in urban planning over recent years has been the increased acceptance of “accessory dwelling units” (ADUs), also known as backyard cottages, granny flats, in-law units, and by many other terms. ADUs are not allowed everywhere, but progressive localities like Seattle, Washington, and Portland, Oregon have recently begun not only to permit them but also to actively encourage their development. Essentially, an ADU is a small house or apartment that is added to an existing property, often a single-family home. This allows a city or neighborhood to gradually increase its density through urban infill, without the negative impact that might come from a large apartment complex, for example. Best of all, ADUs can be a source of income, because a property owner can rent out either the ADU or the main unit. They can also be a source of family unity, allowing extended family members to live near each other while retaining a degree of independence. Localities often suggest or require that ADUs—unlike normal houses—be small. Therefore, tiny houses are a great fit for these situations. To work as ADUs they need to comply with building and zoning codes, which means they must be built on permanent foundations. Still, the benefits of downsizing and simplifying are all there, with the added potential for rental income. Access to urban infrastructure (power, water, sewer, trash disposal), which is generally efficient. Access to services and amenities (schools, grocery stores, shopping, gyms, libraries). Access to public transportation, and generally conducive to walking and bicycling. The potential for increased income if the main unit or ADU is rented out. The potential for increased family cohesion if one unit is used as, for example, a “granny flat”. Increased density and more efficient land use that reduces sprawl elsewhere. Building code compliance likely means that trailers on wheels, for example, are not possible. Possible higher cost (at least up front) to build up to code and pay for permits, land, etc; however, some or all of this cost may be offset by other savings (i.e. not needing to own a car). Building codes come in for a certain amount of scorn in the tiny house community. And it’s true that they (and other laws and agreements, such as homeowner association (HOA) covenants) can, intentionally or unintentionally, restrict or even ban efforts to build small. But I want to offer a brief defense of building codes–followed by a counterpoint. In a purely individualist system, everyone would take responsibility for their own construction; or in a purely capitalist system, every builder might be required to take out insurance, the cost of which could vary based on the insurance company’s assessment of the risk posed by a given structure. In practice, it’s very helpful to have a common set of minimum standards. That way, my house is less likely to burn down, and therefore less likely to take my neighbors’ houses with it. (Big cities like Chicago burned down with startling regularity in the not-too-distant past). Public services such as fire departments, emergency rooms, and disaster response are less likely to be overwhelmed. Insurance companies can provide insurance at reasonable rates, confident that construction adheres to a certain level of quality. As a contrast, it’s instructive to look at the 2010 earthquake in Haiti, a country with little or no enforcement of any kind of building code. The quake killed upwards of 50,000 people (government estimates range as high as 316,000) and rendered up to 1,000,000 homeless. By contrast, a stronger quake in Chile a few months later killed approximately 525 people. While several factors accounted for the lower death toll, Chile’s strict building codes were a major reason that relatively few people died. Tiny house owners may not feel vulnerable to earthquakes, but other forces, like tornadoes, hurricanes, and fire, can have devastating effects on these types of structures if they are not built properly. One of the wonderful things about the tiny house movement is that it allows a wide range of people to re-acquaint themselves with the experience of designing and building their own homes. The architecture and construction industries are highly professionalized, and while some people continue to build their own homes, it’s not common. Building codes are one of the barriers to the “democratization” of construction. Building codes are important, but they shouldn’t stand in the way of reasonable individual expression. Where codes are unfounded or overly restrictive (and I think some minimum size requirements fall under this category), the tiny house movement should consider working to change the system. Creative disobedience is another possible path—as long as your house doesn’t catch mine on fire. I would love to hear your thoughts about tiny house communities. Have you tried one of these models of tiny house living, or another that I didn’t mention here? Let us know in the comments. If you enjoyed this discussion on designing and building communities you’ll love our free daily tiny house newsletter with even more! I like the listing of pros and cons of each type of small house groups. It is very informative. It is good to think of such things. Keep up the good work on small and tiny house information. It is appreciated. The numbers per acre for the Napolean Complex are frightening when translated into either suburban or rural settings, especially rural. People who move to the country for the peace, remoteness, quiet, lack of zoning, ability to keep livestock etc are talking about small acreages but with densities as high as urban settings without the infrastructure to support that many people, that much garbage, sewage, runoff, parking and general spot pollution. I live in an ordinary size house on 5 acres, which is about the smallest acreage you can go for multiple rural dwellings. This septic tank has to be pumped every 4 years, for a family of TWO. Multiply the number of dwellings using that same acreage to as many as 80 -110, and you have a formula for major problems with overtaxing the water supply, exceeding the capacity of any noncommercial waste disposal, problems with parking , and a huge garbage problem. Neighborhood acceptance of an acre with 20 vehicles on it is very very low. Add livestock to the equation, and, think about the waste and sanitation issues. An acre of 20 dwellings in the middle of 5 rural acres is a difficult possibility. Multiply that into larger enclaves? No. I can see your point on overtaxing the water supply, waste disposal etc. but just for a moment, consider this. A mix of homesteading and Eco- efficiency, working together to leave the smallest footprint possible. I also have 5 acres, I live in a 3bedroom,2 bathroom double-wide,which I find to be about 3 times my actual need. I have 5 chickens who produce more eggs than I can eat, but I sell the surplus to pay for their feed. Let’s just imagine a group of 5 or 6 tiny homes, spread out amongst a 5 acre property. They could even be set around a central green, or more spread out, each according to preference. Each Tiny House would have its own solar system and rain water collection system, in addition to a composting toilet. There could be a central homesteading system with chores shared by each household. Fruit trees, chickens, goats, a couple of cows, some ducks maybe…? Children gain so much from learning to take care of animals. A central tool shed, where the community contributes as a whole, and has to sign to leave to the community as a whole if they leave. That way, there is only the need for one tractor, one lawn mower, etc. thus cutting down on gas needs. So far, the footprint is very small, and we have an updated version of a commune (community living) Now I am sure that many might want the freedom of their own vehicles, but personally, I would be happy with a bicycle, and a ride to town once or twice per week to the library and farmer’s market, and grocery store. I would be quite happy to be able to do without a vehicle, registration, and insurance. I rarely use my car or motorcycle as it is, and am seriously considering selling them. I have not long turned 50, and am happy to live solo with my dog, but enjoy the company of others for short periods. I really enjoy visitors with young children who play with my chickens and dog, and relish the company of world travelers, South Americans in particular. I can’t think of anything more pleasant than to be part of a community where I can choose to join in community get -togethers, or have an evening to myself. As for the trash removal, I practice reduce, reuse and recycle to maybe an extreme. I find I can get my actual trash down to just a grocery bag(recycled) or less per week. I take my own bags to the grocery store…. I just prefer my meat double wrapped. I see no reason why one tiny house owner with a pick up truck cannot go to the dump/recycling center for everybody as one of their communal chores. I would be happy to make laundry soap, shampoo, conditioner, home remedies, salves, natural bug repellents etc. I would hate to see as many as 20 in 5 acres, but perhaps a maximum of 10 would work, similar to some of those working museums of villages from the early 1800’s. Of course, it would take a special mix of people to make that work, but then the people who want tiny houses to reduce their footprint are those type of people, are they not? Your ideas sound like my dream of a tiny house with a communal setting. I would like my own space for privacy, but have others around for company, or sharing the work. It sounds like you have thought about this for a while. Yes, it would take a special mix of people. From one tiny house enthusiast (and smaller footprint advocate)to another, keep the dream alive! I’d say, if you are using a septic tank system, then you are using “old” technology when you could (should?) be using composting toilets, and possibly soak pits for simple drainage from showers/baths/kitchen sinks. There are many ways now to manage household waste, but for the most part people are ignorant of these methods, or if not, too lazy or cannot afford to install them. But, as you say, once you get to a certain number of dwellings per acre then systems need to change. And, that means that someone has to pay for them, one way or another. Property taxes, communal levies (for rubbish disposal for example). If you’re in an area where you can’t legally build a dwelling without a septic tank/drainfield/rough in ‘code’ plumbing, you do have the expensive option of installing all that, not using it and then installing a second system. Soak pits/cisterns do not work at all on certain soils, and the runoff from improperly constructed cisterns is a real health hazard – to neighbors and groundwater in addition to your own well. We witnesses these systems in fail mode when we lived in NM; Federal EPA involvement and all. It’s possible to slip under the radar for one dwelling, but multiply it by even 10 on 5 acres and the next thing that happens is that somebody reports it to the State/County and sheriff. Even a single ‘non-code’ dwelling is subject to the same sort of scrutiny. We knew people who were evicted by force from well constructed small homes on backcountry land they owned, because of non-code water supply and non-code sewage/wastewater disposal. These things are real issues for single dwellings – how much more visible is a tiny house community of 10 or more dwellings? But, part of the problem as I see it, is that there are no standardised codes, what is perfectly acceptable in one state/county is absolutely verboten in another. Even if the soil types etc. are pretty much the same. Reality is the rest, the stuff you don’t see, the behind the scenes action like no cell signal, spotty or more likely nonexistent internet and television service, drinking water being hauled in quantity, filtration of well water and maintaining it, grey water swamp stinks and associated insect life of standing water, and the worst part of off grid living…sewage…camping out for a weekend does not prepare one for the realities of dealing with sewage…you can’t just tip out a pot or bucket in the woods, long term that option will spoil a very large area of land and stray breezes will bring you the stench from over a mile away. The outhouse…well, at least it’s not inside where you live. They stink terribly, they also attract flying insects that spread the love to everything they land on. A great many people have died from illness that can be traced back to an outhouse, raw sewage dumped outside, standing water (grey, black, or not), and even now in 2013 it happens every day…people who have the luxury of a flushing toilette don’t ever consider it a luxury, it’s something we don’t want to think about, so we ignore it. All that laid out, there are some rugged folks out there who can do it, or are at least willing to give it a good effort…for you brave souls i say read, ask, think, plan, learn!! before you do real harm to yourself or your family when dealing with sewage!!! Recommended reading, The Humanure Handbook by Joseph Jenkins. I’ve been using this system for over 6 years and it’s not caused a huge stink or been too much trouble at all. http://humanurehandbook.com/ I know other people who use it as well, all living happy and healthy lives without annoying the neighbours. After checking the author i would recommend the book as well, he wrote the book as a master’s thesis while attending Slippery Rock University’s Master of Science in Sustainable Systems program in northwestern Pennsylvania….i expect it’s been read by many who would verify the veracity of the information as a scholarly document…they’re tougher to get past than reviewers or field experts! I agree with Alice, if you don’t believe humanure composting can be free of stinkiness, visit “The Humanure Handbook” author’s land. As for the outhouse, my uncle lives in an old virtually abandoned gold mining town in Colorado. Nothing modern there, no power, no sewer, no running water, only 36 people in the community. Always my favorite relative to visit, I actually enjoy stoking the fire, pumping the water, and it is always an adventure to help with the outhouse tank (takes several people to load it on a truck for the once a year trip to the clean-out station). With proper ventilation, an outhouse can be oderless, I never had to hold my nose in my Uncle’s. There are several examples of properly designed artificial wetland systems for dealing with greywater, many are maintained by government agencies and universities. None of them have ever been described as having offensive odors. Proper methods for dealing with greywater do not stink, pooling everyone’s greywater together in huge open cisterns does, which is why no one wants to live next to the sewer. I’m sure there are people who have had bad experiences with poorly designed outhouses, humanure composts, and greywater systems, but that isn’t indicative of a well maintained and designed system, which can in fact be virtually odor free. Usually it takes a little longer after I publish an article for people to start making references to human excrement. 🙁 Just kidding! Keep up the good points being made by everyone. An outhouse does not have to be unpleasant. If properly built and maintained and properly used, it does not smell. down the outhouse, and washed the seat, bench and floor. maintained outhouse or compost system does not smell and is not a health hazard. For the most part I think John is incorrect in many of his assumptions. In a time when fresh potable water is at a premium, using it to flush effluent away is downright stupid. Just as is not using the appropriate gray water system to water your plants. And the modern suburb of McMansions inter-spaced with water/labor/energy wasting lawns is simply hard to understand. That all of this is encouraged and in some cases enforced by building standards make me wonder if there is some giant conspiracy. Because it sure isn’t logical! Yes, we need building codes. We do not want to return to the medieval practice of dumping sewage in the street. We do not want our building to fall or burn or do any number of other things that can kill or injure people. As technology and society changes, so should our standards. We often must justify what we do and sometimes rightfully so. But who is calling our local building departments to task and demanding they justify themselves? It is past time for someone to do so. Really good points John! Thanks for taking the time to put your ideas down for us all to think about. These are practical things we must consider! I agree with the pros and cons of rural living. I am lucky enough to be only 10 minutes from a small town and I own a local business and two online businesses and do most of my work at home to minimize driving. I would have loved to build in a small house community but there were none that I could find when I built the cabin. A community would be beneficial in keeping costs down as most small home owners do not want a lot of land and could share common property and utilities like power, water lines, and sewer hookups or have it set up like a primitive KOA with an RV dumping station. Communities would also be better for safety as living in a rural area puts you many minutes away from police, fire and hospitals. I waited almost an hour for the FD to show up and put out a field fire that got out of control. Communiteis could also share garden space and animal raising chores and if you have children a community helps to provide your kids with more experiences. I would love to find a small house community that is involved in art, music, gardening and simple living and someday maybe that will happen. Thanks for the article and including my cabin Vincent! While urban fill-in is a great concept, it still requires renting from someone else (and living in their backyard), or buying your own big house/land and then building a small house on that. One requires always paying rent to someone else or having a lot of money to buy a house and then paying a big mortgage forever. For me, what would work the best is if cities divided up those big empty lots into tiny plots for building small houses on. But that is probably wishful thinking. You buy the big house and rent it out. put your tiny home in the backyard and tap into the big home for power, sewer, cable or whatever. Be sneaky and be happy. You forgot 2 large tiny home, in fact the largest of tiny home livers, RV and liveaboard boats. And both already live in communities all over. I’m building a 4-5 unit land one now and likely a 10-20 community soon but I likely won’t live in one. I’ll live in my solar powered trimaran sailboat with that moat between me and the rest. On land too I like living on my own property without others than a lover. I also find owning land is cheaper, especially old mobile homes on lots where you jusy scrap the trailer top and build your own tiny home lewgally on the old trailer frame as a repair or rebuild. In most places it’sa legal as long as it’s as good or better than before. But…if you are in a hurricane prone area and there is a hurricane warning, and you are in a tiny house on wheels, you don’t have to risk any property damage at ALL. Just evacuate your entire house, and bring it back when the hurricane is over! I like the idea of a tiny house community. I wish the spaces between houses were a little larger. You know under the “cons” of rural living was the transportation costs for shopping. Lit Motors has THE cure for that….just not a lot of room for groceries in the C-1 model but I have high hopes for the C-2 and the V-1 delivery van. Willy the Lit-1 won’t ever get into production, nor should it. It only has a few miles range too. But the concept without the gyro complication is excellent. I’m building a 2wh Streamliner EV that will go 100 mph and 100 mile range using little energy , 300+ mpg equivalent making commuting, shopping, etc far less energy consuming for more rural areas. It sits 2 and cargo. It like all my EV’s can tow a trailer and can have an unlimited range generator. The cool thing is your EV can be the power backup or even electric source for some cases. I ran my home for 3 days when hurricane Charley hit, off my lightweight EV’s. I get my MC DL this weekend and will finally be able to drive it. Sad riding for 45 yrs and they make you take a $200 course. One overlooked source of off-grid power is wood. You can build a wood-gasifier out of scrap metal, and use it to run any gasoline engine. Wood gasifiers have been used for years mostly for city lights run off the gas in years past, and power generation in the more recent past. FEMA has designed one for emergency situations, and this design has been improved by the internet community to create a system that is virtually tar free, and is built from items found at the junkyard. Burning wood is not considered polluting due to the fact trees re-absorb their own gases in a natural cycle. These systems are a bit large, and so have only been put in the beds of trucks so far, but eventually will be designed down to fit in the trunk of a car. Imagine, filling your vehicle up with wood chips and/or bio-mass and driving down the highway! Wood has it’s good points but rather hard to make electricity until a low cost eff Rankine/steam/heat engine is available to both power and heat a home/business or even charge an EV. It doesn’t, in fact can’t be bigger as then you end up with too much heat or electricity. Using gas engines work but is very, very hard on them both as there are 8k hrs in a yr and gasified wood has even well cleaned various silica, etc that make them die faster. So you are lucky to get 500 hrs on a rebuild which every 2 months gets expensive. So a 2-4kw 1200rpm uniflow steam engine run from solar troughs with wood/biomass backup is a very needed device that for some reason no one is producing that lasts 5 yrs between simple ring replacement. It could be built by A/C companies as they are the same thing but in reverse, a heat pump instead of a heat engine. It amazes me about this cost of transportation for shopping thing… if you homestead, and build a greenhouse with sunken floor, you can grow for most of the year. Paint the inside of your chicken coop white, insulate it well as you build it, add solar powered lights, and your chickens will lay year round. Cows and goats give milk, = cheese and butter. You can even grow herbs in stacks of recycled plastic bottles. I hate what microwaves do to food, but induction has so far proven great, and takes very little power, so you bake your own Artisan bread and cakes, muffins etc. in an induction oven. EZPZ! Keep livestock, and either butcher one occasionally, or become attached and go vegetarian, either way, you can reduce going to the store down to once per month, just dry goods that you can store in mason jars, or in bins in built in cabinets under the floor. (Rice, beans, flour, yeast, etc). Tiny homesteads? Communal Tiny villages? Learn – apprentice~ – all those skills before heading for a Tiny homestead! Chickens on artificial light ‘egg out’ after 18 months, and you have to buy more. Butchering a big animal is WORK, and without a full size freezer or a large food-in-jars pantry, where do you store it? Winter, many places, brings snow … it is amazing how big your garden has to be to produce most of the (storable) food for one person for November through April. And, *never* get sick, not even for a day. The 1970s produced a lot of experience of how fast things fall apart when a key member of a commune left, or the entire group had the flu at the same time. The sad reality is that most people who currently decide to do the homestead thing – Tiny or not – give up very soon, because their lives up to that point in no way prepared them for the amount of work (and the constant requirement that individual desires be set aside in favor of the needs of the group in a ‘village’). Farming is not romantic or easy; veterinarians, feed stores, fencing supplies, all night vigils with sick animals, predators, varmints, water issues, machinery repairs &&&& are all part of it, and most require trips to town. With the truck! Community gardens have a way of producing lots of arguments! Learn all of it – hands on! – before buying into the Tiny home in the garden of Eden idea! Oh believe me RevW, I am no longer the novice to the lifestyle that you seem to think I am. I can still remember the first winter I spent 4 1/2 hours up on the roof cursing at the top of my lungs while shoveling the over the knee deep snow. I was so afraid of heights back then. The water gave out a day or two later, and I had to dig thru all the snow I had shoved off the roof to get to the rising main. That was when the coyote pack came into the door yard earlier than usual, and I only had a snow shovel. Now 2 or 3 of the beasts in the door yard is no problem, but 6 – 10 in a big pack- I don’t think so!!! Now it’s no big deal to get up there and shovel, I have even thought about getting up there with a spotlight and a gun, but I’m told that is highly illegal, even for coyotes, darn it! I used to get sick big time, for at least a week every winter. Now I get my flu shot nice and early, stay away from school kids, clean every thing with steam or vinegar, and eat plenty of yoghurt, homemade, with the probiotics. It makes a huge difference! I have also educated myself in which herbs ward off illness, or can knock it out in the early stages. Living alone, I can’t afford to get sick. I have spent the all night vigils with sick animals, I have done the emergency runs to the vet (I now keep an animal first aid kit as well as a human one) I know first hand all to well the heartache of a pile of feathers and another less chicken with the remaining all in shock. I must admit, I could not butcher an animal, I can no longer eat chicken, mine have become such pets, lapchickens. As for ‘egging out’ that very much depends on which breed you keep, and how long you leave the lights on for. Besides, if you have a few silkies, as I do, they always want to be moms, to the extent that they have been known to try to steal fertilized turkey eggs (I’m not quite sure how they manage that, they are so tiny) . So it’s no big deal to constantly add to the flock, as long as you have a rooster. If you have ever traveled around Vermont, you’ll see that the out buildings are so much bigger than the homes, even if people are not farmers. If you can’t do things for yourself here, you can’t survive. There is nothing stopping a tiny home community from having a big barn with cold storage inside, a cold storage could be dug underground. I do stock up on a lot of rice and dried beans and legumes in the winter, they take up so much less space than frozen or canned. I often get snowed in, my road is a private one, and I am not shoveling 1/4 mile. I look forward to being able to live off grid and not worrying if the power is going to go out each storm. Rural New England is not kind to the weak, it makes you strong. I have my own power tools, and know how to use them, I have completely renovated my bathrooms myself, tho’ if I never have to replace a toilet and the wax ring again, it will not be too soon! I have had to repair my own roof, deal with hornets, get rid of snakes, and move a tree that fell on the corner of my house. In my younger days I used to do the mechanical upkeep on my motorcycle and a lot of the restoration work on my ’63 Bel Air. Now I trade off good cooking for most of that. I don’t believe in the garden of Eden, but I would like some help, I’m not getting any younger. The tiny house is because I want to live mortgage free and only use 1/3 of the space I have now. I suspect that there are many others out there just like me. Either I sell up and move south, or start a community here. I certainly cannot keep up with it all on my own. Experienced or Novice, I’m getting older, I need to plan for the future. It seems to me that the most time-intensive part of living on a ranch/farm is dealing with the animals. Life becomes much simpler if one is a vegan. It doesn’t take as much land either to supply oneself with ample food. Keeping bees is easy, though, and good for pollination of the crops. Boneyard Studios is the nation’s first tiny house community. It’s in Washington, DC, and has 4 tiny homes. Boneyard Studios is a demonstration facility but from what I have read, no one is allowed to live there full time. It does do a good job of utilizing an otherwise unusable lot (location, shape, etc.) and that in itself is good to see. We live in the bush with no hookups of any kind, the grey water simply runs out a hose and in nearly 2 years all you can see at the end of that hose is a slightly damp patch with grass that’s a bit greener than everywhere else. We have a composting toilet the contents of which is thrown around every couple of months (no garden to fertilise), solar power and backup generator, and for the princely sum of $200 get 5000 gals of water delivered every 18 months (so far anyway, only a single post-tank-install delivery, just last month). So I don’t get all the issues with power, water, sewerage etc. We have no grey water swamp or even any smell, power is available free from the sun (after the initial cost of course and depending on your location) water is either free (from the sky) or cheap. Now I admit there’s just the two of us and the climate is very dry (hardly any rain in over a year) so that may make a difference, I don’t know. We do not even attempt to live off the land, preferring instead to pick the eyes out of what a stable society has to offer in the form of supermarkets etc while being relatively independent of other services. I do almost everything myself, but if I want a shed I go and buy a container and weld in some windows, I don’t spend 6 months whittling one from the available trees. We are probably the first generation that’s had this option, we can live a simple and cheap life without working ourselves into an early grave. Life in the past was HARD and I have no intention of mimicking that. Why does a tiny house community have to be an off-the-grid, back-to-the-land housing solution for fringers and rebels? Tiny houses are not necessarily incompatible with urban and suburban infrastructure and systems. I live near the city of Flint, Michigan which has been decaying steadily for decades. The biggest problem in the city other than murder is blight. Hundreds of homes are demolished every year. Thousands more litter the cityscape. Lonely streets run from nowhere to nowhere through empty neighborhoods of overgrown lots. Most of these lots are held by the county land bank and can be purchased for next to nothing. The point is, this is raw land with all the services and infrastructure still in place–garbage pickup electric, gas, water, sewer. I think a tiny home community could be established in a place like Flint. In fact, this is the kind of area where the ideals of tiny living are sorely needed because so many people are low income. I love the idea of a community of tiny and small homes and even though what is pictured is a good start, I do have one change I would like considered. Rather than have a communal parking area, it would be nicer if each home had a space where they could park adjacent to their home rather than having to carry groceries or even just getting to ones car to go to work or the store. This could easily be achieved by moving the homes to the center of the property with a small street that went around the back of all the homes each with its own parking space. I realize there may be down sides to this scenario, too, but as a woman, the shorter the distance I have to walk to my home, the better…especially at night. I have also seen plans that have the homes arranged around the perimeter of the property with each home having parking accessible from the front via a street that that circled a center park area. Just ideas to think about to solve the dilemma of women feeling safer. To Susie M in Vermont….responding to a post I just saw from 2013! Did you ever attract people to your land, or move south for community? Just networking….sold my land and home and am now open to a small community with others, in NC, where you can have a 4 season garden. Who knows if you’ll see this…like sending a note in a bottle out to sea! Older post: Lessons in Impermanence: Letting Go of the Jacket – Can You Let Go?